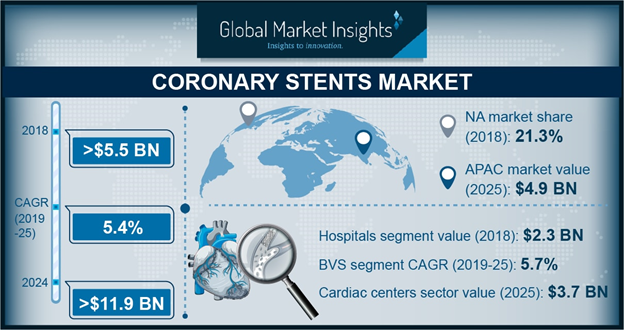 The rising prevalence of chronic diseases such as cardiovascular ailments has been instrumental in fueling the coronary stents market share in the past few years. Sedentary lifestyle and a drastic change in dietary patterns have led to a surge in heart-related disorders across the globe. Predominantly used in heart surgeries and angioplasties, the demand for coronary stents has been increasing which has encouraged medical devices and equipment manufacturers to focus on creating affordable and sustainable products to garner a competitive edge over rivals. The growing utilization of drug eluting stents and biodegradable polymer-coated coronary stents is slated to propel the growth potential of coronary stents industry in the years ahead. One of the most prominent challenges faced by clinical physicians and cardiologists during the percutaneous coronary intervention (PCI) is the prevalence of complex vasculatures or lesions in small vessels of patients suffering from coronary artery ailment. Significantly, it is quite a well-known fact that about 65 percent of smaller vessels are situated in difficult-to-reach areas of the heart, which invariably makes it difficult to treat lesions. Considering these challenges, the Ireland-based coronary stents market leader Medtronic has recently introduced the Resolute Onyx 2.0 mm Drug-Eluting Stent. Elaborating further on the features of the new technology, the FDA-approved high-grade stent is the smallest sized drug eluting stent currently available on the market and is specifically designed for small vessels, which are often untreatable with bigger stents during percutaneous coronary intervention procedures. Moreover, the new stent would further assist interventional cardiologists in treating coronary artery diseases more effectively. In order to overcome the limitations of bare metal stents, numerous companies partaking in coronary stents industry have been focusing on developing drug eluting stents coated with biodegradable polymers. For instance, the India-headquartered medical devices company SMT has recently unveiled an advanced drug eluting stent system Supralimus Grace which has been equipped with a biodegradable polymer coating and features fourth generation design. It has also been further improvised for low deflation profile to retrieve the delivery system after dilation of the stent. In view of such encouraging developments, it would be prudent to mention that healthcare fraternity has been proactive in incorporating drug eluting stents coated with biodegradable polymers to enhance clinical outcomes. Consequentially, this has assisted coronary stents market players to focus on research and tap into new business opportunities being opened up across various geographies in the recent times. Even though the commercialization potential of coronary stents industry appears highly promising, it is quite imperative to take note of a few pitfalls that may hinder the swift pace of product penetration. Owing to the fact that the majority of stent placement surgeries prove to be out of pocket expenditure for populace residing in developing nations, the exorbitant prices of advanced coronary stents has always been a cause of concern. Growing prevalence of coronary artery disease, which is one of the major causes of mortality, along with higher prices of stents have been crucial factors that have compelled various regulatory agencies to boost the availability of affordable coronary stents across their respective countries. The National Pharmaceutical Pricing Authority of India (NPPA), for instance, reduced the prices of drug eluting stents in February 2018. Apparently, pricing control would result in increasing demand and high adoption rate of coronary stents. Moreover, growing per-capita income and healthcare expenditure would further contribute toward the growth prospects of India coronary stents market. In fact, as per a research report by Global Market Insights, Inc., India coronary stents industry is projected to expand at a CAGR of 11.9% over the estimated time frame. The swift-paced technological innovations with regards to the development of high-grade coronary stents and concerted efforts by various medical devices manufacturers to create stents that are user-friendly and assist healthcare professionals would fuel the coronary stents market trends. In addition to this, a favorable regulatory framework across emerging nations would benefit the remuneration profile of the overall coronary stents market which is certain to exceed USD 11.9 billion by the year 2024.